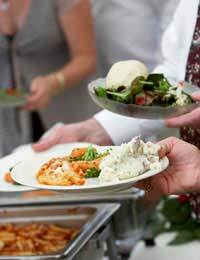 When planning to start a catering company consider wedding catering. This form of outside catering is a very rewarding and enjoyable business as you get paid for helping people enjoy one of the happiest days of their life. These days a wedding can be held almost anywhere. One week you could be providing a hot sit down meal for fifty people in a marquee in someone’s back garden the next a buffet on a luxury yacht. Granted a lot of wedding receptions will be held in conventional halls hired for the day but wherever the reception is held it is your responsibility to see that food and drink arrives on time and to the specification agreed with the bride and her mother,. Always inspect the kitchen facilities of the venue where you are expected to provide food. Are there adequate cooking facilities? What about preparation areas? It goes without saying that hygiene should be the top priority so is the kitchen area cleaned and are there facilities for your staff to wash and change? Be prepared to hire in extra ovens and other preparation equipment if necessary and include this in the quote to your clients. Some brides know exactly what they want and expect you to come up with the finished article – others need to be guided. By all means carry a selection of menus covering everything from simple finger buffets to elaborate fine dining. Your final menu selection will depend on the facilities at the venue, seasonality of fresh produce and the budget of the bride. Remember also that you should not be afraid to tell the bride and her mother if you feel the menu they require is too elaborate for their guests. Everyone wants the day to run smoothly and if the guests are faced with the type of food that does not appeal to them there could be a lot of unhappy people at the event who will be leaving for home early to eat beans on toast or escaping to the local chippie for sustenance! Apart from the main meal – also known as the wedding breakfast – you could be asked to provide a buffet for the evening which normally will be for more people than the daytime meal. Your catering services could also be expanded to include supplying cakes, entertainment, flowers, table decorations, favours and so much more. Some people still like to arrange their own catering for their weddings and parties. You could extend your catering services to include the hiring out of catering equipment. This could include china, linen, cake stand and knife, cooking equipment – even uniforms for the serving staff. You would charge a deposit in case of damage or loss plus a hiring fee. All that you would have to do would be to deliver the items and collect them the next day, wash them thoroughly and store for the next outside catering event. You will need extra waiting and kitchen staff when carrying out wedding catering. Arrange for the staff to arrive early enough to be briefed about their duties. Although most staff will provide their own outfit which traditionally is black trousers or skirt and a white shirt it will impress your clients if your staff has a proper uniform. These outfits can be purchased from suppliers of catering equipment and they can also have your company name or logo embroidered onto the uniforms which will give your catering company the correct corporate image.